This is a very special childhood song i sang along with my uncle when he played the guitar. We will both serenade the love song sang by The Beatles. AWesome groupie whose songs are so hip and evergreen..still old of the oldies hits! 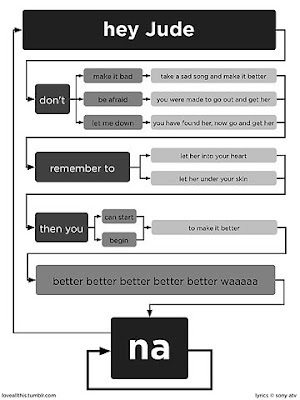 Anyway...when we came to the chorus part of the song, which is the "na" as seen in the link diagram above, we would just go crazy, shouting at the top of our lungs on sunday and repeated the "Na, na, na , na-na-na-nah!na-na-na-na-nah!Hey Jude!" This ritual continues until we both exhausted our breath and can no longer take in any more air into our lungs!